Stamp the Antique Writing onto Punch Layering Paper using Punch Ink. Adhere ribbon (S.E.I) to sides. I used a very thin line of Glossy Accents - my favourite glue. 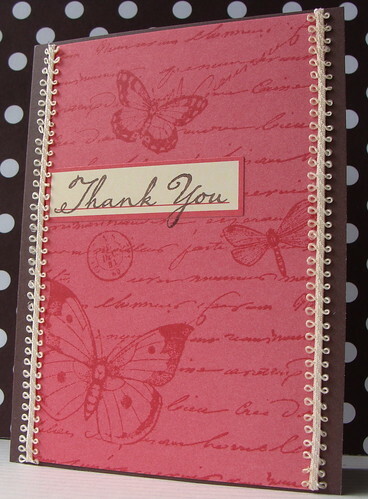 Adhere panel to a Hero Arts Chocolate Notecard. Such a Pretty card Lucy....Love the edging you added! LOVE this card Lucy! I love the colors you used and I love the pretty edge! It's perfect! Simply gorgeous, Lucy!!! So glad you could join us in the Embellish challenge.